2012. Rated R, 139 minutes. Airline pilot Captain Will Whitaker (Washington) parties hard. He drinks until he can no longer lift the bottle to his lips, snorts coke and bangs stewardesses. He’s also an unbelievably talented flyer. When his plane full of passengers starts falling apart, he pulls off a miraculous landing. Six people lose their lives. However, subsequent tests show that everyone on board should’ve been killed. Will is hailed as a hero when he wakes up in a hospital. Luckily for him, he suffers no major injuries. Unluckily, but not surprising, both alcohol and cocaine are found in his system immediately after the crash. An attempt to keep him out of jail ensues. Riding to Will’s rescue are his long-time buddy Charlie (Greenwood) and a lawyer named Hugh (Cheadle). Their task is made incredibly tough by the realization that Will didn’t just have a wild night. He’s a raging alcoholic. 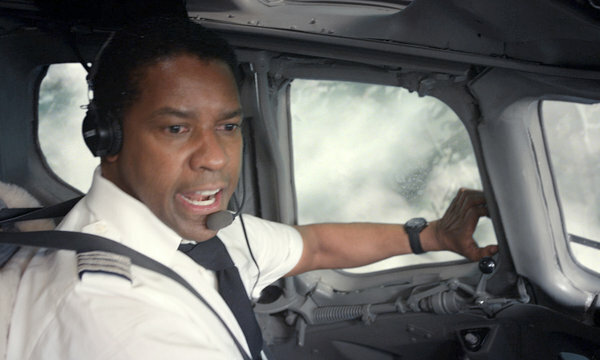 As such, Denzel Washington gives a performance worthy of his lofty status. 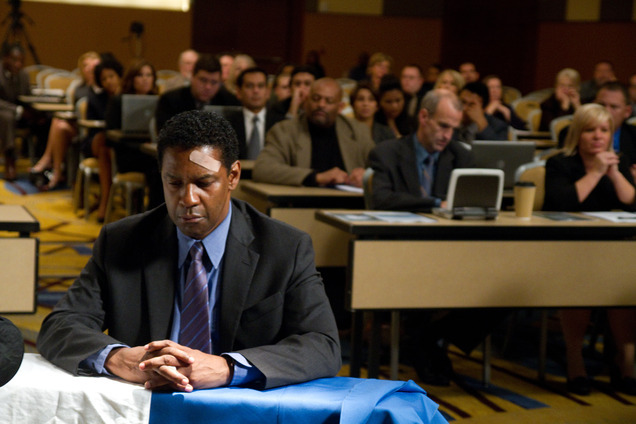 For the first time since American Gangster, the star turns in truly compelling work. He’s not alone, either. Don Cheadle is his usual excellent self. Kelly Reilly is also good as Nicole, the girlfriend he picks up at the hospital. Perhaps, the best performance belongs to John Goodman as Harlan, Will’s buddy/coke dealer. His screen time is severely limited, but he steals every scene in which he shows up. Director Rob Zemeckis keeps things moving along at a very nice pace. It’s actually a pretty big feat considering the only action scene is right at the beginning. Such movies can feel like the air has been sucked out of the balloon. Here, the adrenaline-packed opening smoothly transitions into character study without alienating us. That study is conducted in a manner that makes us care for this man and his predicament. However, Flight is not without its faults. Mainly, it’s just in-your-face preachy. It eventually gets to a point where it feels less like a movie and more like a public service announcement. We get the message because we’re hit in the head with it repeatedly. Other things that would’ve served the film better aren’t explored nearly as much as they should. For starters, how and why did Will become a drunk? How did he and Harlan become friends and what impact does that have on the situation? Without these and other answers, Flight has no more depth than a thirty second commercial for Alcoholics Anonymous. Due to an outstanding cast and expert pacing Flight mostly overcomes its flaws to be an enjoyable experience. These combine to make Will Whitaker a person in which we really become vested. We see the shards of his life littering the ground beneath his feet. We hope he can pick them up and glue them back together in order to save himself.